In his Homily Archbishop Nichols said that the message brought by Pope Benedict XVI in 2010 included an encouragement for Catholics to give witness to the beauty of holiness, to the splendour of the truth and to the joy and freedom born of a relationship with Jesus Christ. This witness, Archbishop Nichols said, would best grow through a deepening of a life of prayer. Archbishop Nichols also recalled Pope Benedict's call during his State Visit for clearer moral values, needed for a peaceful and harmonious society. Full text of the homily by Archbishop Nichols follows. Today we come to thank the Lord for the blessings of the Visit of Pope Benedict to the United Kingdom one year ago and to ask for the Lord’s grace to profit fully from the inspiration of those wonderful days. Each of us has our special memories from those days. I hope there has been time to reflect on them, study his words and refresh the joy and encouragement we experienced. “The procession of banners revealed the true depth and role of Catholicism in England today. The line was long and diverse – it brought tears to my eyes to see the effort that everyone puts into living out their belief in the sacred value of each human being…. Those words, I suggest, sum up the gift and challenge we have received. Yes, we are to be effective witnesses in our society; and we can only be so if we are close to the Lord, strengthened by him in holiness of life. And Pope Benedict, through his words to our young people, called us to be the saints of this age. For me, three phrases sum up the message of Pope Benedict to us all. It is, of course, a message that reaches beyond the Catholic community and is one which we can pursue with many others, especially our fellow Christians. But it is addressed to us, first of all. The witness we are to give, he said, is to the beauty of holiness, to the splendour of the truth and to the joy and freedom born of a relationship with Jesus Christ. In the words of Pope Benedict, prayer is simply being in silent inward communion with God at the heart of our thinking, our meditating, and our being. Prayer is letting the Lord have the right of free speech. This means that every one of us is called to renew in our lives the practice of daily prayer. There is no fixed or set way of prayer that suits everyone. Each of us is to pray as we can, and be faithful to that practice. And coming together in a family for prayer is a great foundation for family life. Secondly, Pope Benedict urged us to be witnesses to the splendour or wholeness of the truth. And he gave us an astonishingly clear lesson in how to do so. Who can forget his address in Westminster Hall? Building on the strengths and achievements of our democracy, he placed the great gift of faith at the service of our world today. He did so with sensitivity and reasoned argument, without hectoring or condemning, inviting rather than demanding, firmly but gently. How are we to think about meeting this challenge? The prayer of Pope St Gregory the Great comes to our help when he prayed for ‘the grace to see life whole and the power to speak effectively of it’, for love of the Lord. Our Catholic faith, illuminating reason, gives us that gift. We see life whole when we recognise the true nature of the unborn child. We see life whole when we see in every pupil not only a future contributor to our economic prosperity, not only a future parent and leader, but also a spiritual being whose deepest needs and surest happiness can be answered only in the mystery of God and in a personal relationship with Him. We see life whole when we recognise the limited value of our personal experience as the criterion of moral truth. We see life whole when we recognise that the well-being of every human person has to be at the centre of our economic life, the ultimate purpose of our striving and the measure by which we are to judge success. We see life whole when, in sickness and terminal illness, we both treasure life as it is and do not fear death when it comes, so that we neither deny the dignity of life at its endings, nor fail to welcome our journey to God when He calls. In our exploration of life in its fullness we are aided and inspired by our own Blessed John Henry Newman. How much we can rejoice in a new wave of interest and devotion to this great man. We rejoice in his sensitivity to our culture and his insistence on the reasonableness of faith in God in an age of agnosticism and doubt. He will continue to inspire us. Perhaps today’s Gospel expresses most forcefully the challenge of seeing life whole. We heard, somewhat incredulously, of the owner of the vineyard paying those who came so late to work as much as he paid to those who had laboured all day. The parable focuses on not so much the lot of the workers, but the absolute generosity of God, whose merciful actions go way beyond the requirements of justice. We are always tempted to reckon life in terms of our achievements and our possessions. But when we see life whole then we know it is all a gift of God. All we have is God’s gift. When this is clear, then we are able to serve generously, to give freely, for what we have is already a gift, and what is freely received can more readily be freely given. As the Holy Father said in Hyde Park, “Faith is meant to bear fruit in the transformation of our world through the power of the Holy Spirit at work in the lives and activities of believers.” Today we pray that the long line of banners and groups of Catholic action in our society will grow stronger and longer, coordinated centrally for strength and flourishing locally in responsiveness to all the needs and demands of our difficult times. 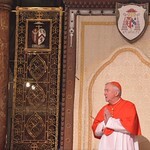 Finally, Pope Benedict reminded us of a key testimony that we are to give: that of joy and freedom. How many in our society would immediately associate those qualities with the Catholic Church? Yet they are there, to be seen in so many. Approaching two million young people – including some who were not so young at all – gave unmistakable testimony to that joy and freedom born of a relationship with Christ at the recent World Youth Day in Madrid. This was a manifestation of youthful faith and friendship, reaching to every continent. Maybe its secret was expressed in the words of a young pilgrim from this country: “Catholic is what we are, not something we belong to!” That sense of common, inner identity, as opposed to a sense of membership of an organisation, is something for many of us to rediscover. Being a Catholic is a way of life, not a set of membership duties. Being a Catholic is expressed in everyday actions, the habits of a maturing faith, actions of devotion, kindness and, indeed, self-denial, actions which are willing expressions of our love of the Lord who alone is the source of our joy and freedom. I hope that this is the spirit in which we will embrace the communal act of Friday abstinence, sharing together in our identification with Jesus in his self-denial for our salvation. Let the joy and freedom born of our loving relationship with him lift the burden of so much anxiety and strife from our hearts so that others may see the hope and consolation we receive from him. My brothers and sisters, today we do indeed give thanks for the ministry and charism of the Bishop of Rome, the Successor of St Peter. We willingly express again our love and devotion to him, the visible touchstone of our faith and truly our Holy Father in the Church. We promise him the support of our prayers and we commit ourselves to working each day, in our families, our friendships, our schools and our parishes to reap a hundredfold from the seeds he has sown in our hearts. May this truly be a moment of fresh wind in our sails, a moment of hope and confidence in the gifts that our Catholic faith offers to our world.